"Other than a toque, what kind of hat can a guy wear to keep his ears warm?" Anonymous, that's an excellent question! My thoughts immediately jumped to the bulky furry or shearling hats with very obvious ear flaps, which, honestly speaking, I'm not too crazy about. Styled in the right way and worn with confidence, these hats might look good, but to me they've always had undertones of fur trappers and the Soviet Union. I instead opted for sleek options that could keep ears warm while looking right at home in an urban setting that isn't Moscow. 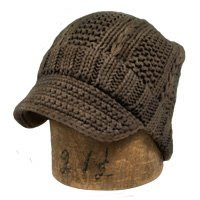 Aside from the furry ear flap hats, the most obvious alternative would be a toque-like knit hat with a brim similar to the 'Urkel' by Goorin Brothers ($25). Its alternating rib knits create dimension and visual interest, while its overall style is versatile enough to pair with a wool peacoat or a down parka. 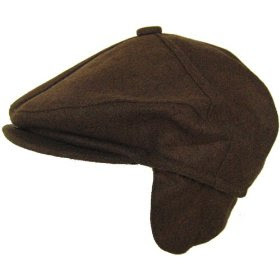 Another option is a wool cap with hidden ear flaps, such as this one ($28-30). In extreme weather conditions, the hidden ear flaps can be let down; at other times, you can wear it as an ordinary cap. 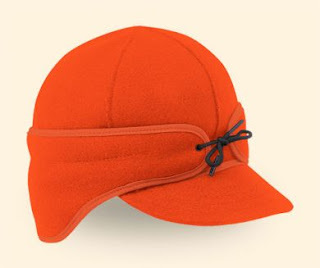 However, my favourite find of the bunch has to be the Stormy Kromer cap, a 105-year old design created by a railroad engineer and baseball player. Sick of his engineer's cap flying off in windy work conditions, Stormy asked his wife to sew ear flaps on an old baseball cap one day, and the rest is history. Outdoorsmen swear by the hat's comfort, warmth, and ability to stay put on one's head. I love how it basically looks like a warmer version of a baseball cap. But the best part for you, Anonymous, is the cap's patented ear band system: Those bands that wrap around the front of the hat can be pulled down a bit in the back so that they cover the tops of your ears. Very subtle, no? The 'Rancher' cap ($44.95) comes with an extra Thinsulate layer beneath the wool and slightly longer ear flaps to keep your head extra toasty. In other news, I always love trying to help someone out with a style conundrum. If there's a question you'd like answered, leave it in the comments or email it to solo.lisa.blog@gmail.com! SUCH great options. Husband Mike has taken to hiding inside his coat hood, but I love him in a cap. Love all 3 - great picks! Didn't Elmer Fudd wear a pretty good hat? Awesomeness. I like all three. Still going to that post..probably this week. very savvy options. warmth is of upmost importance. Who knew anything called 'The Urkel' could be stylish?! So cute! I find it super funny that I have yet to meet a Russian (and I've met more than I knew existed in Vancouver in the last four months than I have in my life) wearing a big furry earflap hat unless it's part of a military ensemble they're required to wear, while everyone else goes nuts with it. Nice pieces. I really like those trapper hats and I almost bought one...but then my mother said it was for boys...might still get one though.